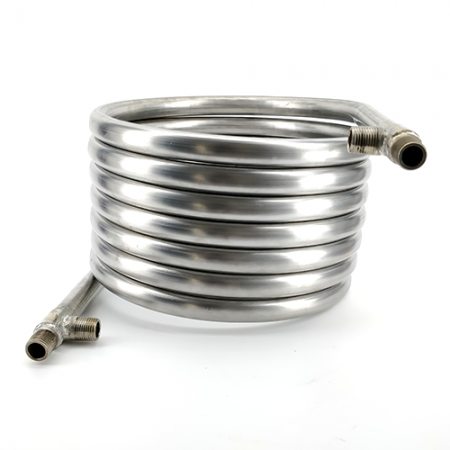 6.5mm Passivated Stainless Steel Coutnerflow Chiller with 1/2 inch BSP male thread connectors. The Coolossus is big, strong and built like a brick s*!#house. You won't find a better chiller for a better price than this! Chill your wort down like a pro! Unlike plate chillers that utilize coppers great conductivity, this 6.5m fully 304 passivated stainless steel chiller can withstand high hop additions without clogging. The Coolossus also has high chemical resistance unlike plate chillers and other copper immersion chillers, StellarSoda Friendly! Get the best clean possible with StellarSoda or StellarClean.